The amazing world : National Geographic POD, April 2010 、Corn farmer working at down, Iowa 、Jason Hinson, a sixth-generation corn farmer near Kingston, Iowa, keeps an eye on his auger as he unloads his combine on the fly. 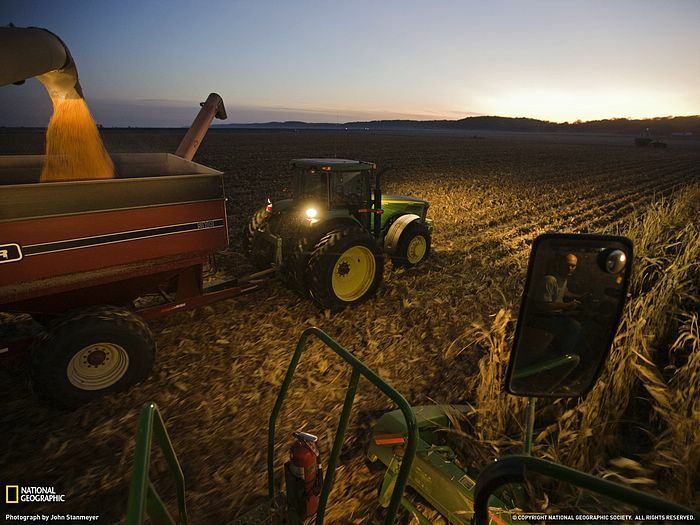 Federal mandates for corn-based ethanol soaked up 30 percent of the 2008 U.S. crop, helping send corn prices over eight dollars a bushel last year—triple the 2005 price. As long as energy prices remain high, biofuels will compete with food for land and water across the globe.